Even though he is one of the youngest drivers on the grid, he has more diverse experiences on his CV than several of his competitors. He began his racing career in karting in 2004, before quickly moving on to the Asian as well as the Northern European Formula Renault. He went on to gain experience in a handful of other Formula Renault championships, such as the Italian and the Swedish one. He immediately won the title in the latter in 2009. In 2010, he moved on to Formula 3, being crowned European Formula 3 champion in 2015. The following year showed just what the young Swede is made of. Not only did he compete in DTM with Mercedes and Indy Lights, but also the Blancpain Sprint Series, the Blancpain Endurance Series, ADAC GT Masters, the Intercontinental GT Challenge and the IMSA WeatherTech SportsCar Championship. 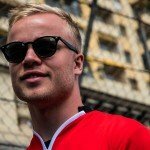 In the end of the year he also joined Formula E with Mahindra Racing. Just as his CV suggests, he was quickly able to find his rhythm in Formula E, setting the fastest lap during his first ever race in the electrically-powered racing series and putting his Mahindra on pole-position just a few weeks later in Marrakesh, where he also secured his first podium finish. He then went on to take an on-the-road double victory in Berlin, the second of which was taken away following a penalty. Third place in the standings in his rookie year proves the Swede’s street racing pedigree and as one to watch for season four where he targets a title assault.